A few months ago I made a big decision around where I buy my meat. No more flavourless supermarket chicken and lamb, even if it was ‘grass-fed’ and ‘organic’. I realized I cared too much about how the cattle, pigs, chicken and sheep are treated to trust it to the supermarket supply chain. I wanted to buy direct from the farmers I could build a relationship with and trust. To be honest I wish I’d made this ‘rule’ for myself years ago. And apart from the odd sausage, chorizo and black pudding, all the meat I’ve cooked since September has been from the farmers market. Mostly the price evens out about the same. But I’ve really noticed is how much better everything tastes. Especially chicken. Especially now I can get my hands on thigh fillets with the skin on. Yum! So today I thought we’d have a little look at my favourite chicken recipes on Stonesoup as well as share a new recipe for one of my current favourite sauces that is brilliant with (you guessed it) chicken. My simple take on the classic way to use up leftover roast chicken bones and meat. A match made in heaven. Roast fennel and chicken with orange and lemon. Amazingly fresh and, dare I say it, finger-licking good. When you’re in the mood for something quick and light but not a cold meal. This is just the thing. Uses minced (ground) chicken so it’s super quick to cook and you don’t have to worry about over cooking the chicken. A great place to start if you’re not a confident meat cook. If I’m cooking whole chicken, I generally ‘butterfly’ it like this because it cooks much faster. My friend Ellen made this recently and like me was blown away by how two simple ingredients can cook down into such a delicious dish. A simplified version of one of my Irishman’s all time favourite things to cook. So easy even my Dad can make it. And mild enough to be family friendly too (it was the first ‘curry’ Finbar ate!). A French classic, it’s something I make at least once every Winter. A recipe that didn’t make it into my print book 5-Ingredients 10-minutes because I wasn’t happy with the original photo and was too lazy to re-shoot. Still a favourite sauce especially now I’m having a Middle Eastern food renaissance. One of my mum’s most exotic recipes from my first print book ‘And the Love is Free’. A brillant way to actually use your carrot tops. Especially great with home grown ones. My super simple take on the Italian family-favourite. An old recipe from way back in 2008, this pre-dates my 5-ingredients philosophy so is way more complicated than most Stonesoup recipes. But it’s super super delicious and really lives up to its name so if you’re up for a bigger project this is for you! Another from the archives, this is a spectacular way to cook a good chicken! Basically you make a salty dough and wrap the chicken and bake. It’s a bit nerve wracking getting the timing right but well worth the effort if you want to impress your guests. Definitely not one for a Tuesday night after a long day at the office! Gotta love a good meatball. Made lighter with the use of chicken instead of beef. An Indian-inspired curry with an amazing sauce based on wilted greens. So good! Such a brilliant way to ‘jazz up’ your favourite cut chicken. Basically just toss the cook chicken and some spices in a paper bag and shake to coat. Instant flavour hit! OMG this sauce is the business! It’s fresh. It’s zesty. It’s got lovely warmth from the ginger. And I love the crunchy texture you get from the spring onions. You have to try it! I’ve adapted the recipe from three sources, the brilliant Momofuku cookbook, my friend Aggie (whose family are Hong Kong Chinese) and Melbourne chef Andrew McConnell who writes for the Saturday Paper. The first time I made it we had it with chicken steamed in the slow cooker (remind me to tell you about that another time). Just loved how the moist clean chicken flavours were brought to life by this vibrant sauce. It’s also great with pulled pork (in a Korean style Bo Ssam). 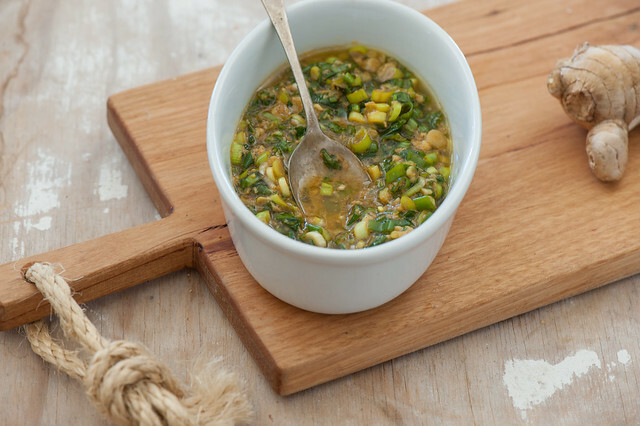 But you could pretty much use it with any chicken… stir fried, roast or BBQ. It’s also a great way to dress up good old egg fried rice. 1. Stir all ingredients together in a small bowl. Taste and adjust the seasoning as you think it needs it. A little more soy for extra salt, more vinegar if you think it’s a bit lifeless. Or just regular sea salt if it’s lacking something you can’t quite put your finger on. 2. Stand for at least 10 minutes or up to an hour before serving with your choice of chicken (see note above). If you need to store for longer pop it in the fridge and bring back to room temp before serving. Will keep for a week or so. 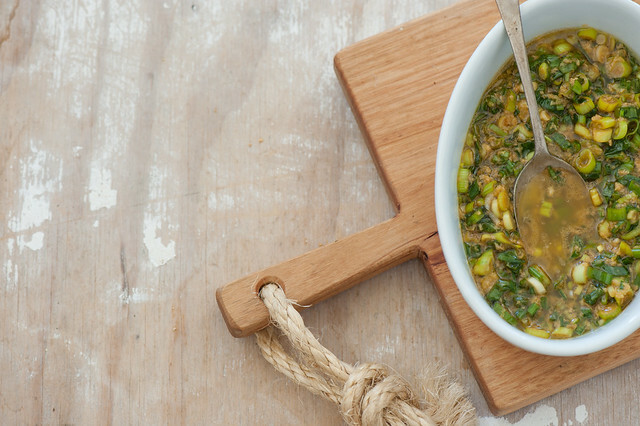 warm sauce – heat oil in a small saucepan until hot to touch then pour over the remaining ingredients. (This is good but I prefer the freshness of my recipe). different vinegar – sherry vinegar is totally my favourite here but you could use any wine vinegar. If you have Chinkiang vinegar it would be good too. * a note about ‘spring onions’ – in Australia they’re often sold as ‘shallots’. The ones you need don’t have the big bulby onion bit at the bottom (which I call ‘spring onions’). I think the correct term is green onions but I didn’t want to confuse you! What do you call them? soy-free – just season with sea salt. If you have access to coconut aminos they would be the best substitute. ps. Looking for Christmas gift ideas for the food-lovers in your life? Then I have just the thing! 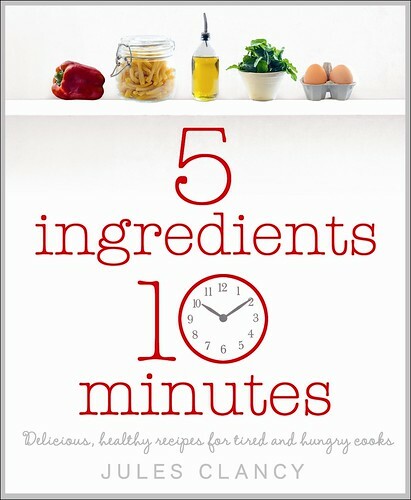 The print version of my cookbook ‘5-Ingredients 10-Minutes’. And so glad your husband loves the stir fry! Did you ever share the recipe for chicken steamed in the slow cooker? I quickly searched your site and couldn’t find it. Thanks! No I haven’t Sandra published one Sandra – but need to work on my steamed chicken so thanks for the reminder! In SA we call them spring onions. Have never seen what the eastern states call salad onions (with a bulb on the bottom) for sale here. I now call my shallots/green onions ‘scallions’ which I think is the British term for them. I have done some member indexing for Eat Your Books and this the term they use too. And I get very cross that thigh fillets are impossible to but with skin on now, or even thigh cutlets with skin and bone are difficult to find. I have a great recipe that can share with you using these or other chicken pieces but it does need pieces with skin and bone for the sauce! How can I send it to you for trialing?